You're the Bride...let them all know! 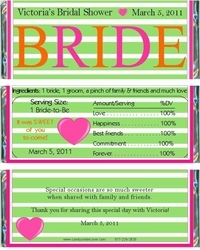 Our GREEN & ORANGE BRIDE CANDY WRAPPER design is a great way to let the everyone know you're getting married. Your guests will love this sweet token of your appreciation. Chocolate is the Sweetest Bridal Shower favor and is sure to be a hit at your party!